Nowadays almost all industries have manometers, transducers and pressure switches that need to be checked or calibrated. For this purpose we need high precision standards to compare and record deviations. These standards can be used on the ground or in the lab bench. The 918 Pneumatic Pressure Test Pump is a manual pressure pump designed to generate pressure from 95% vacuum at 1,500psi (100bar). The Metrel aPAT Link Android application is a new and revolutionary Portable Appliance Testing software tool. The application simplifies the portable appliance testing and tagging process, reduces the working time, reduces errors, increases flexibility for printer/scanner connectivity, and improves overall user efficiency. An Android device with the aPAT application creates flexibility by serving as a link between PAT tester, barcode scanner and printer. The application also uses a smart phone’s built in camera as a QR code reader. The Additel PCal pressure calibration software is used with the 681 pressure gauges, 672 calibrators, and any of the 9XX pumps. With a built-in high performance electronic pump and precision pressure controller, the 761 from Additel series portable automated pressure calibrators provide a turn-key solution for calibration of gauges, transmitters, and switches both in the field and in the laboratory. In a portable package, this calibrator Additel 761 can automatically generate pressures from 90% vacuum to 600 psi (40 bar) with 0.005% FS pressure control stability and 0.02% FS accuracy. To improve the calibrator accuracy, two pressure modules with differing ranges are built-in and integrated with the internal pump and controller. The new and improved testo 270 is latest generation of our proven range cooking oil testers. Testo’s 270 allows you to determine the quality of cooking oil faster and more reliably than ever before. Testo 270 measures the ‘Total Polar Material’ (TPM) content in the oil, which is a sure indicator of its quality. By using improper oil not only will the food produced be of a lower quality, but there are also health risks surrounding cleanliness. Cooking oil develops its best potential between 14 and 20% TPM. Using this measurement tool to understand exactly when oil needs replacing also makes sure you aren’t wasting oil. You don’t want to be replacing perfectly good oil by changing too frequently as this will increase oil consumption and ultimately costs. 3 channel temperature measuring instrument T/C type K/T/J/S/Pt100, audible alarm, connection for max. 3 optional radio probes. The robust and compact measuring instrument with a probe socket for highly accurate Pt100 probes and two sockets for fast-action thermocouple probes. Readings from up to three additional temperature probes can be shown on the instrument's clear display; measurement data transmission is by radio i.e. wireless. A total of six channels can be collected in this way by the instrument. Using the highly accurate, plug-in Pt100 immersion/penetration probe, a system accuracy of 0.05 °C with a resolution of 0.001 °C is reached. 1 channel food temperature measuring instrument T/C Type T, audible alarm, connection to an optional radio probe, with battery and calibration protocol. Besides measuring minimum and maximum values, readings can also be printed on site on the Testo fast printer. In addition to the wide range of standard probes with cable, a wireless radio probe can be used simultaneously, if required. The fast-action, efficient temperature measuring instrument, testo 926, for the food sector. The optional TopSafe protection case renders it insensitive to dirt, therefore making it the ideal partner for large-scale kitchens, hotels, restaurants or the food industry. New concept of data acquisition with the Saveris 2 via WLAN and Cloud. Nowadays the market requires solutions with the latest technology and signal acquisition with the concept of "cloud" designates the informatics revolution of access to measured data from any point in the world and from any device with Internet Explorer like PC, phone or tablet. The acquisition system Testo Saveris 2 is a modern solution for monitoring of temperature and humidity values in storage rooms and work rooms. Loggers from Testo send the data directly to the Cloud that stores the values safely via WLAN, with an adjustable time range. Testo 175 T1, 1-channel temperature logger with internal sensor (NTC) incl. wall holder, lock, batteries and calibration protocol. The Datalogger Testo 175 T1 is the compact data logger for the long-term monitoring of refrigerated and deep-freeze rooms as well as for the documentation of transport temperature in delivery vehicles. The large 1 million measurement value memory and the long-life batteries allow readout at greater intervals, in spite of the shorter measurement rate. Like all Testo data loggers for applications in the food sector, the Testo 175 T1 is tested according to DIN EN 12830 by the ATP testing section of the TÜV Süd for HACCP purposes. It is sometimes important to test whether the prescribed temperature limit values in a process are being adhered to. The Testo 176 T3 in its robust metal housing is the right data logger for parallel measurement and recording of temperature values at 4 different sites in industrial processes. The requirements of a many different applications can be fulfilled using a broad range of connectable thermocouple probes (Type K, Type T, Type J). The base is the heart of Datalogger Testo Saveris and can save 40.000 readings per channel measurement independent of the PC, which corresponds to a year capacity memory with a measurement interval of 15 minutes. A stack help ensures that any alarm is transmitted and not lose any data in case of power failure. The system data and alarms are displayed Saveris the display base. Even if the PC is off, the base emits a alarm via LED exceeded some threshold value, or optionally via SMS or via the relay output which can connect a transmitter alarm. In total, a base can incorporate 150 radio and Ethernet probes or 254 measurement channels. The Datalogger Testo Saveris base is connected to a PC through a cable USB or Ethernet. The base Saveris provides a high versatility with greater security. Probe NTC internal radio Saveris T1. The probes are radio optionally available with or without display. Similarly shows the current measurement data, the battery status and quality of radio signal. The probes radio-frequency testo Saveris measure temperature and moisture. In the measurement cycle, the probes recorded measurement data and send it to the central base at regular intervals. If the threshold is exceeded, the radio connection is established immediately. Through bidirectional transmission, the radio frequency probe and the base contact is each other. This, however, ensures that measurement data are only registered and do not suffer interference from other radio systems frequency. The black box to securely transport goods in the pharmaceutical, food and Hospital areas. Monitoring temperature, humidity and vibration in accordance with all applicable laws, rules and regulations is essential for transporting delicate goods. Whether working with food or drugs, both types of products have certain needs of refrigeration during transport and under no circumstances the cold chain can be stopped between the manufacturer and the consumer. Otherwise, you may affect the quality, produce financial losses or even serious damage to the health of consumers or patients. Saveris U1E Coupler with 1 Ethernet channel analog current/voltage. In addition to the radio probes, probes can be used connected directly to Ethernet. For this you can use the existing LAN infrastructure. The internal memory ensures that measurement data are not lost even that fails to provide electricity or LAN connection. The display shows the current measurement data and the status of the probe. The different versions (probe connectable partially) adapt to any application condition. This new professional digital clamp meter for measurements up to 1000 A AC/DC offers a wide range of functions. 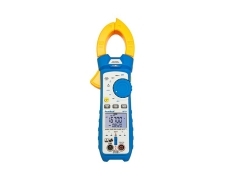 The PeakTech 1670 supplies additional features such as the ability to determine two temperatures at the same time and the direct current measurement in µA/mA range. This newly developed and innovative digital storage oscilloscope offers cutting-edge technology and performance, and multi-functionality for different user groups from the electronics service, development or industrial sector. In addition to the 2-channel oscilloscope a full digital multimeter with voltage, current, resistance and capacitance measuring range is integrated in the device. Additionally arbitrary waveforms can be outputted with the integrated 25MHz waveform generator. The new PeakTech 3442 is a new digital multimeter for heavy duty use with a high variety of useful measurement functions. By keystroke, the display of the device can be switched between 3 5/6-digit LCD and a high resolution 4 5/6-digit LCD, whereas all measurements are gathered as True RMS values. In addition to the comprehensive measurement functions for current, voltage, capacity, resistance and many more, this new developed device has a 4-20 mA current loop measurement, low-pass filter and an Auto-Hold function, among many other things. The TA-650P calibrator performs functions where three different instruments are required: dry block thermal bath, standard thermometer and calibrator for TCs, RTDs, mA, mV, ohms and thermostats. Besides these functions, they have HART® communication protocol, data logger mode, Ethernet interface and USB. The new advanced line temperature calibrators are the result of more than 20 years of experience in the manufacture of dry block gauges. Sensor calibration has never been easier thanks to the user-friendly touch-screen display. Enables rapid calibration test report retrieval without the need for specific software installation. The ADT875-155 is the new dry block calibrator from Additel. With this calibrator Additel enters in the temperature calibration world. It combines excellent stability, radial and axial uniformity, quickly. With the PC option we add the 3-channel temperature reading capabilities with a process calibrator. The calibrator has a range of use of -40 to 155ºC, resolution of 0,01ºC, precision of ± 0,18ºC and stability of ± 0,01ºC in full scale. The Process Calibrator (PC) option combines the many functions of a HART Process Calibrator with a Temperature Calibrator. With this option we have the ability to read a reference RTD plus 2 channels of signal mA, V, switch, RTD or thermocouple. In addition, the calibrator allows you to create tasks and HART communication. Let’s you capture screen images for future needs with the one touch of a button. Using a reference RTD it is possible to control the calibrator by the reference probe or the internal probe. MI 3152 EurotestXC is an instrument from the new generation of Metrel’s multifunctional measuring instruments. The already well known functions like complete installation safety testing according to IEC/EN 61557 and auto sequence testing of TN, TT and IT earthing systems are managed by a completely new user interface based on large color touch screen display. A wide range of functions is included: from on-line voltage monitoring, phase sequence testing, earth resistance measurement, illuminance measurement and TRMS current measurement up to RCD tests, line and loop impedance tests and earth resistance measurements. Are you prepared for the mandatory inspection of electrical installations? The Directive 2005/36/CE and 2006/123/CE were fundamental to create the new Portuguese law no. 96/2017 entered into force in January 2018, making it necessary to update many old electrical installations and inspect them, not only due to the new law, but also due to the deterioration of their quality and safety. For this purpose F.Fonseca sells instruments from Metrel as the new model MI 3155, which allows carrying out all the required tests by the directive. Metrel MI 3109 EurotestPV Lite is a photovoltaic (PV) tester. It performs all necessary tests required on photovoltaic installations. This includes all of the tests as required by EN62446, but also includes I - U characteristic measurements, calculation to STC values and power measurements on Inverter’s DC and AC sides (single-phase only). MI 3109 EurotestPV Lite is optimized for PV tests therefore the Autotest operation mode is implemented which is intended to perform a complete set of test needed for verification of PV installations according to EN 62446 with pressing off only one button. With optional accessories the same PV test functionality as with MI 3108 EurotestPV is available. The A 1532 EVSE adapter is a special accessory intended for testing Electric Vehicle Supply Equipment (EVSE) together with supported METREL installation testers. It is used for verification of electrical safety and functional testing of EVSE. It is intended for testing Mode 3 EV supply equipment with a type 2 connector. If used together with the MI 3152 EurotestXC’s AUTO SEQUENCE®, the complete EVSE charging station can be tested (state-by-state) electrically and functionally with a push of a button. It is possible to create a professional station-based report with MESM. All portable electrical equipment must comply with certain requirements for electrical safety with the user and should therefore be subjected to rigorous electrical testing instruments such as the MI 3309 from Metrel. The MI 3309 enables measurement of earth resistance, insulation resistance and leakage/load current and TRMS voltage. Still allows the differential leakage current test, the touch leakage current test and differential test. The test result can be positive or negative depending on the values ​​that are programmed into the instrument by the user.